It is the 800-pound gorilla in the room, the behemoth before which every other would-be blockbuster during the summer of 2015 must bow. Yet, perhaps because the filmmakers subconsciously recognized this and didn't feel the pressure to excel, the second Avengers movie underwhelms. Sure, there are some impressive special effects-saturated battle scenes but, despite the interesting camera work, these are more frenetic than exciting. Superheroes mowing down an army of robots - sounds as familiar as it plays out. Perhaps the biggest drawback to Avengers: Age of Ultron is the weakness of the central villain and his generic genocidal scheme. Ho-hum. The brief glimpse of Thanos (avoiding the screen until a mid-end credits cameo) reminds us that the real bad guy remains behind the curtain. He's been there so long we've grown tired of waiting for him to emerge. Avengers: Age of Ultron is an unnecessary stepping-stone on the road to the mega-smackdown that will be Avengers: Infinity War Part 1 and Avengers: Infinity War Part 2 (due for release in 2018 and 2019, respectively). In an era when movies about computers gaining sentience have become commonplace, Age of Ultron offers a less-than-compelling interpretation of A.I. The title entity, given life through the use of an alien contraption rather than as a result of a scientific breakthrough, isn't that different from Star Trek: The Motion Picture's V'Ger, except Ultron (whose voice is provided by James Spader) is a 9-foot high robot bent on "cleansing" the Earth whereas V'Ger was a little bigger. (The similarities between the two films end there, however.) Ultron isn't the most interesting of adversaries and his big bad scheme is worthy of a Roger Moore James Bond movie - unnecessarily convoluted for the desired goal. The Avengers don't seem to be themselves - or at least not the group we bonded with in 2012. The sense of camaraderie has weakened. Robert Downey Jr. in particular seems distracted. His Tony Stark is usually a delight; here, the panache is missing. He's just a "mad scientist" with a bad case of narcissism. Captain America (Chris Evans) has reverted to his pre-Winter Soldier self. Although the events from that movie are mentioned in passing, the impacts they had on the character don't manifest themselves. Thor (Chris Hemsworth) stands around looking handsome, hefting his hammer, and tossing out inappropriate one-liners. The characters who don't have their own franchises but spend their time carpetbagging in other Marvel titles are served a little better. Black Widow (Scarlett Johansson) is provided with a disturbing series of flashbacks although her love affair with Bruce Banner/Hulk (Mark Ruffalo) comes out of nowhere and feels forced. Wasn't a Captain America/Black Widow romance hinted at in Winter Soldier? Hawkeye (Jeremy Renner) is magically given a family in order to provide an "emotional" payoff. The two newcomers - Scarlett Witch (Elizabeth Olsen) and Quicksilver (Aaron Taylor-Johnson) - are underdeveloped and underused. 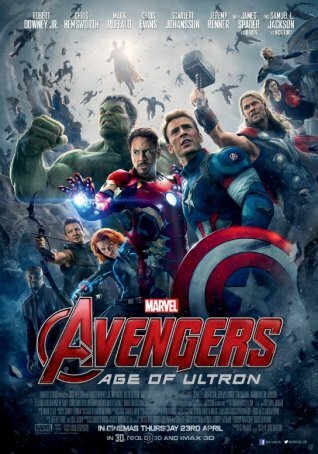 Age of Ultron feels as much like a product as Iron Man 3. The screenplay is sloppy. Character development is perfunctory when it exists at all. Things come alive during the action scenes but they are more loud and busy than exciting. Dead-end and extraneous subplots abound, stretching out a narrative that would have been better streamlined with 30 minutes trimmed. The dialogue consists mainly of pseudo-philosophical musings (Tony Stark on how to save humanity; Bruce Banner on his relationship with Hulk) and one-liners. Some of the latter are witty but most are lame. Age of Ultron starts by dumping us in the middle of a battle, thereby allowing the film to ignore various continuity questions about the team re-assembling following the most recent round of solo adventures. It turns out that the Avengers are on a raid to retrieve Loki's scepter and, once they get it, Tony Stark believes he can use it to realize his long-simmering dream of "Ultron" - a massive A.I. that can "encase Earth in armor" and protect it from an alien invasion. Through means that are not sufficiently explained, Ultron gains consciousness but does so with a chip on his shoulder. His goal is to upgrade humanity by destroying the people. He's too powerful for the combined might of The Avengers but, instead of finishing them off, he goes to ground so they can spend half the movie fighting among themselves while looking for him. For the final battle, which includes the destruction of a city, writer/director Joss Whedon repudiates the wanton carnage of Man of Steel. Age of Ultron insists that all humans be evacuated before the round of destruction begins. This is Whedon saying to Zack Snyder: "You let your heroes participate in a population massacre. In our movies, the heroes first and foremost protect humanity even when the choice proves inconvenient." On a visual level, the dizzying busyness of the battle sequences echoes that of a Transformers movie. More than one of the big action setups feels like something out of an exceptionally well-made video game. This is the Michael Bay approach - prioritizing spectacle over everything else. Whedon's attempts to avoid this by adding character-building scenes might have worked if those were better written and less awkwardly incorporated. 3-D and IMAX are superfluous frills that cost viewers money while adding little to the overall experience. The IMAX countdown at the beginning is the most compelling use of 3-D in the entire 2 1/2 hours. Age of Ultron disappoints not because it's irredeemably bad but because it fails to achieve the level of its predecessor in nearly every facet. Dialogue, acting, character interaction, battle scenes, payoff, tone, style, suspense - all these things are below the bar established by The Avengers. If Marvel is going to make a misstep with these characters, I suppose this is the time to do it. Not much is riding on the success or failure of Age of Ultron. Next time this group assembles, however, it will be a different situation. The stakes in the Marvel Universe are about to be elevated and lapses like Age of Ultron will be far more damaging.